For over half a century mature couples have made Wildwood, NJ their getaway destination. It's no wonder why. Wildwood is a classic American vacation spot with everything you need for you and your loved one to have a blast together while creating memories that will last a lifetime. Wildwood is an entertainment and relaxation hot spot for vacationers from all over the world. You'll love being surrounded by the fun art-deco and Doo-Wop style architecture, vintage American cars, and classic diners. Take a trip back in time by exploring the riveting history of our little neck of the woods. Wildwood's options for great food are nearly endless. You can sink your teeth into mouthwatering burgers, snack on giant pretzels while cruising the boardwalk, or enjoy an elegant dinner in a romantic restaurant. Here are a few recommendations to get you started on your dining adventures in Wildwood. Share a romantic evening dining on perfectly prepared seafood in the beautiful relaxed open air environment at Beach Creek Oyster Bar & Grill. The culinary experts cook up delicious food that will have you coming back for more. The menu here offers great options like fresh caught fish and a fabulous raw bar. Enjoy dinner while surrounded by stunning views and the best entertainment anywhere in Southern New Jersey. Doo Wop Diner. Visitors love the friendly service and tasty food so much its been given a Certificate of Excellence from Trip Advisor 6 years in a row. You’ll find all of your breakfast favorites on their menu. Millions of vacationers hit the beach in Wildwood every summer, and the Doo Wop Diner is a huge hit with the crowds. It's easy to see why people love this restaurant: tasty food, quick and friendly service, affordable prices and cool Doo Wop music and memorabilia. So it's no surprise that the Doo Wop Diner has been a featured restaurant in Travel & Leisure Magazine, ranks consistently high for all of Philly on the Fox 29 News Family Restaurant HOT LIST every year, and has been featured by Sunny Anderson on the The Food Network! Here's a coupon for a free sunday. For hearty sandwiches, fresh salads, and juicy burgers your choices in Wildwood are bountiful. When you’re looking for that something extra in your traditional American fare check out Dogtooth Bar & Grill. The lunch and dinner menus offer a diverse selection of food that combines flavors from all over the world. Try the Cabo Tacos with blackened mahi-mahi, avocado, fresh pico de gallo, and shredded cabbage on flour tortillas topped with their special cilantro-lime sour cream. These three eateries are not random selections. They are fine establishments we thorough enjoy with our friends and families. So enjoy and Bon Apetit! 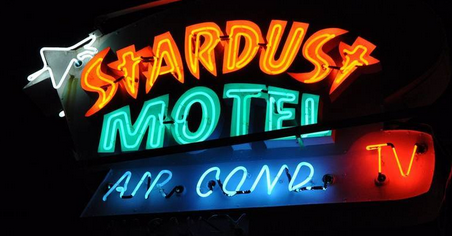 Stardust Motel staff are experts at making the Wildwood experience special for couples. This motel has been a popular lodging spot servicing visitors for over 40 years. This Doo-Wop style motel offers a cozy retreat directly across from Morey's Pier. We have a lot of extra parking on premises and are walking distance to many of the exciting Wildwood attractions, restaurants, and shops. The Riviera in Wildwood, NJ is clean, quiet and comfortable with beach block location for a hassle free vacation. Riviera Resort & Suites caters to mature couples, families and Wildwood conventions attendees. Casa Del Sol Motel is a classic mid-century inn that will transport you back in time. Located in the heart of the Doo-Wop Historic District and only two blocks from the convention center, this is the best location for convention goers. You'll have a lot of fun meeting new people at Casa De Sol Motel. The on-site lounging deck that surrounds the big sparkling pool sets the scene for relaxation in a social environment. There are picnic tables with umbrellas and a play set for the kids on the Southern Sun Deck for outdoor afternoon lunches. Plus, each room has been recently updated with new furniture for you to enjoy. Suites are available with fully functional kitchenettes complete with dishes and utensils. Contact us today to book your trip to Wildwood. We will save you time and money when making your reservations in Wildwood with us, so you don’t have to worry about planning and your accommodation budget. Make your Wildwood hotel reservations where "Good Times are a SHORE Thing"!